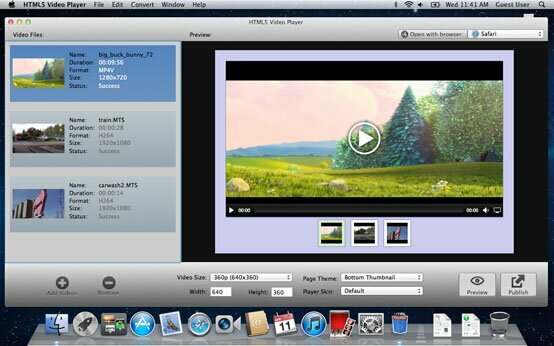 Convert any video to HTML5 H264 Video! Html 5 Video Player is an easy video program that helps you create HTML5 H264 video for your websites in a few clicks. How to create HTML5 H264 video for your websites with HTML 5 video player? You can simply drag and drop your source videos to the HTML5 h264 video player and converter . Or you can go to the Edit menu >> Add Videos to browse through your video albums on your computer and select to add them to the HTML5 H264 video software. Once you are ready with tuning the video player, click the Publish button to generate your HTML 5 video player. It will be saved in the Output Folder of the video tool on your hard disk. Go to the HTML5 menu, then choose Open Output Folder from the drop-down menu list. Note: The HTML 5 player will create MP4(MPEG 4) files with H264 video codec and AAC audio codec that is fully supported by all HTML 5 browsers. FAQ: Do I have to make three versions of my video .OGG, MP4/h264, WebM as they are all native HTML5 video types? Yes, for greater compatibility of different browsers and browser versions, you need to make three different version of the same video and hopefully make a Flash version for fallback display on old browsers that do not support the HTML5 videos. However this HTML 5 Video Player has made it much easier. It by default will generate three copies of your source video in OGG, MP4, WebM formats and a Flash fallback feature is enabled. Now you are ready to publish your HTML5 H264 video to your HTML5 website.